The relief of no longer living with a toxic person is a reason to celebrate your bravery and strength. 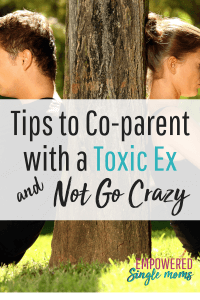 But do you struggle to co-parent with a toxic ex? Your life is still intimately intertwined with his because you have children together and your custody agreement requires you to work together. I have witnessed many stories of toxic exes in my office. Trust me, you are not alone. You are not the first single mom to figure out how to parent with someone you used to love, but don’t even like anymore. Are you wondering, “What was I thinking when I chose him to be the father of my children?” It doesn’t matter what you were thinking. Put that behind you. Now, you need to figure out how to work with him on raising the most important people in your world. 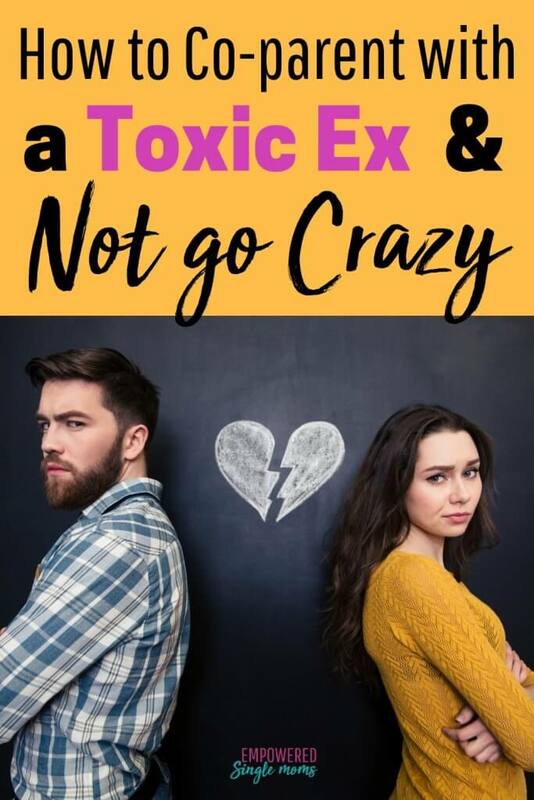 Why is the relationship toxic? Maybe the relationship is toxic because he is an alcoholic or a drug addict. He could be abusive. It could be toxic because he seems like a narcissist (not everyone who seems like a narcissist actually is, but more on that later). Or is it toxic because you have vastly different values and you are trying to get him to conform to your values and priorities? Your children’s safety is your first priority. Ask yourself honestly if your children are safe with him. If not, do everything you can to legally ensure their safety. Consult with your attorney to understand how to best handle this where you live. In the United States, if your children are being abused or neglected, Child Protective Services will investigate and determine a course of action. That said, they are cautious when investigating situations during a relationship breakup because there is an extremely high risk of one parent reporting the other out of retaliation. Be clear that your child is being abused or neglected before you report this to authorities. A difference of opinion does not always equal abuse or neglect. If your children are safe and their basic needs are being met, be grateful for this. I know it may be like climbing Mt. Everest to be grateful for and to your ex, but gratitude will help more than you can imagine. You can be grateful to him for the gift of your children. Think about your children, their personalities, their gifts, skills, and talents. What did they inherit or learn from him that makes them who they are? Consider these things a gift from him to them and you. My children both have a frighteningly sharp intellect. Though I am no slouch in the intellect department, I know part of their fantastic brains come from their father and I am grateful to him for that. They both have musical abilities that take my breath away. They definitely inherited that from their father. In my family singing happy birthday in tune is a major feat. Whenever I hear them sing or play an instrument, I am grateful to their father. If you are in a co-parenting situation, you will have regular child-free time. You can use this time for self-care or to build your career. You will need to focus on your career now that you are the sole breadwinner and child-free time will be necessary. Being grateful to the other parent will ease the tension between you. He will sense your warmth toward him and it will help to lessen irritation and defensiveness. Get a worksheet to help you make it possible. Your ex is probably hurting as much as you are. I know he may not act like it, but he probably is. I have heard many men tell me how sad or angry they are that their relationship with their children’s mother didn’t work out. This was not his plan either. I have even heard a few tell me they minimize time with their children because it is just too painful to deal with their ex. I know this may seem dumb to you, but it is how a few dads feel. Remember, once you loved him and thought enough of him that you wanted to have children with him, so he is probably not all bad. Try to remember the good in him. Even the devil has a strength–he is persistent. The Serenity Prayer is a standby for twelve-step groups. Many people are familiar with the first stanza; however, the poem/prayer takes on a richer meaning when read it in its entirety. In a co-parenting situation, you only have control over some things. You have little or no influence over what happens at the other parent’s house. If your children are safe, you need to let it go. Focus on what you do have control over and work on that. Maybe your ex does have a personality disorder, but under stress none of us are at our best–and divorce is stressful. Being a single parent is stressful and co-parenting with someone we can’t live with is stressful. According to the largest study ever conducted on personality disorders by the U.S. National Institutes of Health 5.9% of the U.S. population has borderline personality disorder (many of the same selfish characteristics) and 6.2% has narcissistic personality disorder. As some people fit both diagnoses, about 10 percent of the U.S. population has borderline personality disorder and/or narcissistic personality disorder. Maybe your ex does have a borderline or narcissistic personality disorder. Consider that your ex is hurting, under stress, and doing the best he can. Be empathetic, but not stupid or enabling. I know “stupid” isn’t a very nice thing to say, but you can be respectful and polite without being a pushover. Be kind, but don’t be a doormat. We are a participant in the Amazon Services LLC Associates Program, an affiliate advertising program designed to provide a means for us to earn fees by linking to Amazon.com and affiliated sites.” Read the full disclosure policy here. Boundaries are always important. If you are dealing with someone who has a narcissistic or borderline personality disorder, you will need be especially vigilant in maintaining boundaries. Consciously decide what those boundaries need to be and maintain them. The saying, “I gave him an inch and he took a mile,” was probably first said about someone with one of those personality disorders. One of the things you do have control over is your own boundaries. It is correct and proper to identify and maintain your boundaries. Do this both with your children and your ex. Have minimal rules and expectations. Enforce the rules you do have. Do your best to walk the line between kindness and firm boundaries. Be grateful for the good your ex has given you. Check out the OurFamilyWizard website – Communication tools for divorced parents. It is a fantastic tool to help you with maintaining clear communication and boundaries. I made a worksheet to help you start changing your relationship with your ex. Remember, often co-parenting gets easier as you both heal from the devastation of the relationship ending. As long as your kids are safe, you are going to have to get used to letting go of what you cannot control. Try to find gratitude for your ex, and remember that he is going through a rough patch too–even if it may not seem like it. It may help you to write down some of these positive thoughts about your ex and reference the note in times of need. 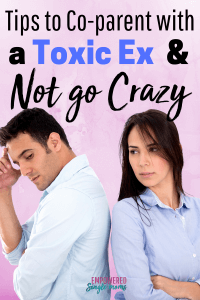 In time, you may no longer feel that your relationship with your ex is toxic.